How he makes each failure a learning experience. Daniel Boulud: I wear contacts, so I put my glasses on. And then I go to my son’s bedroom and see how he’s doing. Unless I have an alarm clock and then the first thing I do is shut that off and go back to sleep. DB: Many things. I make a very big breakfast every day and I have a ritual with my family where we spend at least two hours minimum together in the morning. We have a breakfast of champions and that keeps me quite well fueled for the day. And then of course, there’s my work, my team, and the challenges I come across at work. I think it’s the excitement of this business. It’s a lot of work, but my job is what keeps me thriving. Three times a week I go to the gym with a trainer and that gives me a lot of energy too. DB: I’m the only one in my family to be in America. I have a large family and all of them are in France. My parents have 5 children who then produced 14 grandchildren and 14 great grandchildren. So my life hack is to call them all the time and keep in touch with them. We have a Whatsapp just for family members to keep us all connected. Also, for the last 32 years I’ve called my family in France every Sunday morning. DB: Croque en Bouche by Fanny Deschamps. It’s a book that was written in the 70’s, and it was the story of a day in the life of Alain Chapel, one of the great French chefs. He was so passionate about what he did, and it was very inspiring to me. I read it as a very young chef and I really admired him and dreamt that I would be like him one day. DB: I only use it as an alarm clock. From midnight until 9 a.m. it’s on Do Not Disturb mode. It helps me disconnect, which makes my wife happy. She has very strict rules when it comes to our phones. Because we have young children, we only read books to our kids, and we try not to have electronics at the table or around that much when we’re at home. I’m not totally obsessed with my phone and I don’t feel the need to answer right away. It can be really disrupting. I try to control myself, which isn’t easy, but I do my best. DB: I have two assistants and we deal with it together. One of them speaks French, which is important to me. I always have to have a French assistant. She’s my lifeline. DB: If I’m in my office, I’ll go home because it’s right upstairs. And I’ll play with my son. Once I’m up there I’m away from work and it’s perfect for me. DB: It happens to me often after long trips. Sometimes I’ll have trips to Asia and I’ll come back in the middle of high season. And sometimes I won’t get enough sleep for two or three days. I’m quite blessed at work and I have an amazing team that supports me, and it’s easier with them. When I started my business I experienced a lot of burnout where I just exhausted myself and worked day and night. Especially in my business, it’s easy to work until midnight, but I try to maintain a healthy life and not push myself over the edge. DB: I was just reading a great quote by Nelson Mandela. He said, “I never lose, I either win or learn,” and that’s how I feel about life and about my business. I think failure is often a lesson. When it’s business and it’s a question of money, I don’t want to be emotional to the point where it can ruin my life. I started with nothing and I’m very happy and proud of what I’ve accomplished, and I’m looking forward to what I’ll accomplish next. And once in a while you have to shake things off. We had a four star rating in the New York Times and we lost one. Of course all my team felt like we lost, but to me I just felt like we were learning and we’ll get it back. What’s important is our customers and our team and to stay as strong as ever. There are things like that in life that can throw you off your horse, but you just have to ride back with pride. Daniel Boulud, a native of Lyon, France, is considered one of America’s leading culinary authorities and one of the most revered chefs in New York, his home since 1982. Daniel is Chef-Owner of 13 restaurants around the world, and is best known for his eponymous, exquisitely refined DANIEL on Manhattan’s Upper East Side. Outside of New York, the chef’s cooking can be found in London, Singapore, Toronto, Montréal, Miami, Palm Beach, Washington DC, and Boston. Boulud is the author of nine cookbooks, the recipient of multiple James Beard Foundation awards including “Outstanding Chef” and “Outstanding Restaurateur,” as well as The Culinary Institute of America’s “Chef of the Year Award” (2011) and The World’s 50 Best Restaurants “Lifetime Achievement Award” (2015). 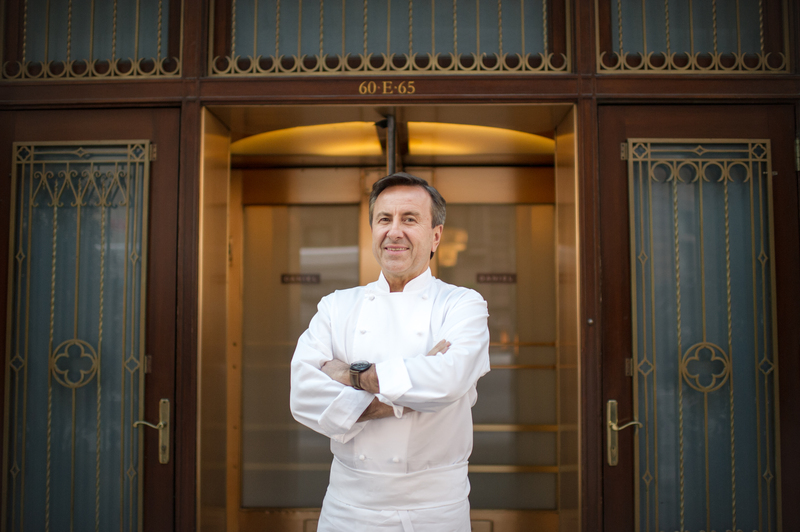 Boulud was named a Chevalier de la Légion d’Honneur by the French government in March 2006 in recognition of his contributions to the advancement of French culture. He is a generous supporter and Co-President of Citymeals-on-Wheels for more than two decades, and is Chairman of the Ment’or BKB foundation.